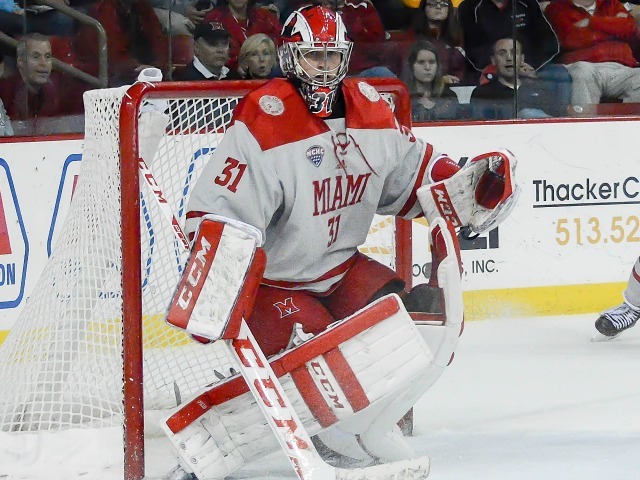 OXFORD, Ohio – Despite being outshot by more than a 2-to-1 margin, Miami found a way to hold off No. 5 Denver. Three times the RedHawks led by two goals but saw that margin shrink to one each time as they escaped with a 4-3 win over the Pioneers at Cady Arena on Friday. Denver (11-6-4) practically played keep-away with the puck all night, won the overwhelming majority of battles to loose pucks, had a better passing game, etc. Miami (9-8-2) was outplayed in pretty much every aspect except the one that counts: Scoring goals. The final shot total was 47-19 in favor of the Pioneers, and the disparity was amazingly consistent: DU 16-16-15, Miami 6-7-6. RECAP: Casey Gilling scored 70 seconds in after a strange carom off the boards left him with the puck alone in front of a wide-open net. Freshman defenseman Rourke Russell slammed home a rebound early in the second period to make it 2-0. Denver cut the lead to one later that frame, but Miami went back up by two when Josh Melnick made a ridiculous behind-the-back pass to Gilling for a blast from the top of the faceoff circle. That made it 3-1, and the Pioneers again cut the lead to one before Louie Belpedio ripped one home directly off a faceoff win by Melnick. Denver scored again late and nearly tied it in the closing seconds. STATS: Gilling finished with two goals and an assist for a career-best three points, and he was 11-6 on faceoffs. Melnick picked up a pair of helpers on each of the critical late goals. Goalie Ryan Larkin stopped 44 shots. Dylan Gambrell scored twice on 12 – yes, 12 – shots on goal to pace Denver. Miami was 2-for-4 on the power play and held the Pioneers to 0-for-5. THOUGHTS: The process may have been ugly from a Miami perspective, but this Denver team is easily the best the RedHawks has hosted all year. The Pioneers’ skating, speed, defense and finishing ability shined in this game, and they are far more skilled than MU. But despite being outmatched and not playing its best, Miami still found a way to win. The RedHawks will need to beat a lot of ranked teams down the stretch if they hope to return to the NCAA Tournament for the first time since 2015. From an entertainment perspective this game ranked as one of the best at Cady Arena this season, as Denver came close to tying it a couple of times in the closing moments. – Gilling is quickly moving up the Miami forward depth chart. He now has 11 points, with six coming in the last five games, and his hockey IQ extremely high. His faceoff percentage is top on the team. – Despite being in the J-term, the RedHawks’ brought in a “sold-out” crowd of 2,277 without a student section. The university bought its tickets and gave them to faculty, which could potentially add new fans, especially with the excitement level of this game. – We’re tweaking the write-up format a little so we can get to the key points quicker, make for easier reading and try to conserve a limited amount of weekend free time. And we’re coming to the conclusion that if we can’t pump out a gamer within a few hours of the final whistle it serves little purpose. So we’re going with one story with the recap included. Reader input is always welcome. FORWARDS: C. As is too often the case, Miami just doesn’t get much contribution by forwards not named Melnick or Gordie Green, and it’s now safe to throw Gilling into that list. Conor Lemirande played a lot on the PK and had a solid game overall. He picked up an assist and went plus-1. This corps finished with just 10 shots. Miami’s Rourke Russell (photo by Cathy Lachmann/BoB). DEFENSEMEN: C+. The good: Belpedio scored the eventual game winner, Russell also found the net and blocked six shots. The bad: Overall this corps was unable to contain Denver’s super-talented forwards, who were able to skate around in Miami’s offensive zone seemingly at will. Chaz Switzer added three blocks including a critical one in the final minute that may have prevented a goal. GOALTENDING: A-. Rarely does a goalie deserve this high of a grade after allowing three goals, but Larkin made 44 saves for a .936 save percentage, and without a strong presence in net Miami would’ve lost for sure. Didn’t get a great look at the first Denver goal but the second and third ones were nearly unstoppable. LINEUP CHANGES: None. This is the second straight game in which the same 19 were on the lineup card. WRAP-UP: Miami was held to its second-lowest shot total of the season and allowed 13 more SOG than in any game of 2017-18 and was able to beat the fifth-ranked team in Division I. The hockey gods were with the RedHawks in this one. OXFORD, Ohio – Well, maybe it’s best to look at the weekend as a whole. After an epic win over No. 5 Cornell on Friday, Miami dropped a 4-0 decision at Cady Arena on Saturday to finish the weekend with a split. Back to the old cliché that if you knew heading into the series that the RedHawks would take 1 of 2 against the fifth-ranked team in Division I, would you be happy with that? Most would probably say yes, especially considering Miami is a .500 team right now. Yeah, Saturday was forgettable. There were the defensive lapses, poor officiating and the inability of the RedHawks to do anything offensively the first two periods. The game was pretty much over when the Big Red (10-2) fired the third goal in, 38 seconds after their second, as a player stood wide open in the slot waiting for a pass. The better team took advantage of two early power plays and lackadaisical play on the third, then coasted the final 47 minutes, as Cornell entered play allowing 2.00 goals and 23.6 shots per game. Shut down is the Big Red’s specialty. Miami needs to find to way to overcome that vs. the balance of its NCHC slate chock full of high-ranked teams. No forward not named Melnick, Green or Gilling has recorded a point in the past three games. – Another disclaimer that we try to keep official criticism to a minimum, but this group of refs Nick Krebsbach and Brad Shepherd and linesmen Ryan Madsen and Paul Karnathan were truly brutal. The Grant Hutton call on Friday was nowhere near a major, and yet they initially ruled a game disqualification against the defenseman, which carries and automatic suspension before reducing it to a 5-and-10. It’s hard to believe that was a miscommunication issue between the on- and off-ice officials, and the off-ice officials relayed a DQ penalty to the PA announcer. – Then there was the faceoff fiasco. Gilling had an in-depth discussion with a lineman before a drop on Friday, and in this game, Gilling took exception to a Cornell foe’s positioning, and he was booted by one of the refs after he refused to move into faceoff position. Gilling later received a 10-minute misconduct, and interestingly did not return. Alec Mahalak was drilled in the head at his own blue line. No call. To be fair, the loss shouldn’t be blamed on officiating, but it hurts the integrity of the game. Cornell was the better team and deserved to win. But film of this series will not be used in the how-to portion of the officials’ training videos. – No forward not named Gilling, Melnick or Green recorded a point on the weekend. – With Gilling gone, Karch Bachman joined the Green-Melnick line but results were inconclusive. FORWARDS: F. Just 17 shots and obviously no goals. Once again a key member of this corps was out of action for an extended period of time for arguing (Gilling). Not much going on at all after the top line. DEFENSEMEN: C+. The first two Cornell goals were scored on the power play, and the third was on a breakdown in slot coverage. This corps wasn’t a huge factor in the outcome. GOALTENDING: B-. Ryan Larkin was 19 of 22 and was pulled with five minutes left and Miami down by three. The first goal was very stoppable, but the next two on a tip-in and a point-blank shot, respectively. LINEUP CHANGES: On defense, Scott Dornbrock returned to the lineup as Rourke Russell sat. Russell had played 14 of the first 15 games, and Dornbrock has missed just two contests. Zach LaValle was back on the ice in favor of Austin Alger, who logged limited minutes in his return from injury on Friday. 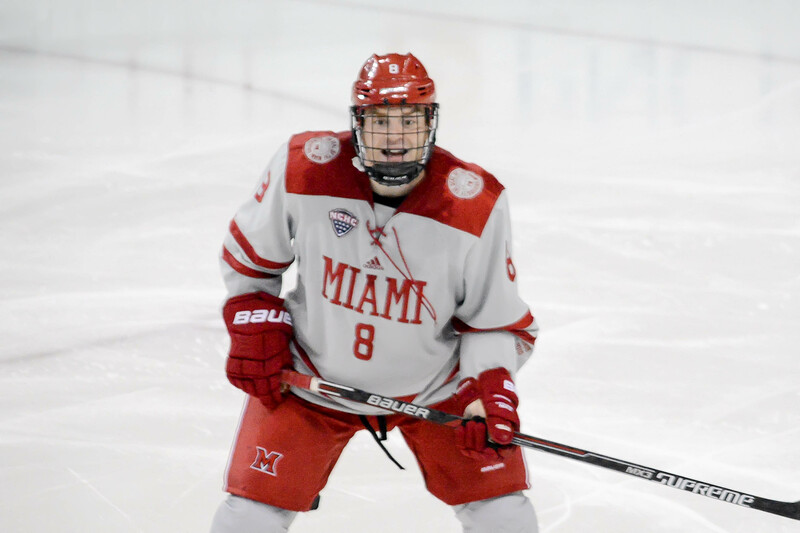 OXFORD, Ohio – Poll your average fan on what he or she thinks Miami’s odds of winning would be if the team was down a goal four minutes in, and two minutes later faced a five-minute penalty kill against the fifth-best team in the NCAA. And for good measure, was without elite defenseman Grant Hutton for the balance of the game. That was the RedHawks’ predicament early on Friday, and yet they rallied to a 2-1 victory over No. 5 Cornell at Cady Arena. Like the UMD win sparked by Chaz Switzer’s fighting major, Miami’s emotions were tapped when Hutton was ejected for checking from behind. The call, which for the record should’ve been a minor and no more, was initially read as a major and a game disqualification, which carries with it a compulsory suspension. It was announced at the first intermission Hutton actually received a game misconduct, which means he was done for the night but would be eligible on Saturday. And if we take the player in question into account, Hutton had 50 penalty minutes in 86 career games entering this one. Zero major penalties. Quite impressive considering this is a guy that logs more minutes than anyone on the team except possibly Louie Belpedio and defends opponents’ top forwards every night while playing a physical, punishing game. Back to the game: Hutton out, five defensemen left. And oh yeah, Big Red were badly outplaying Miami to this point. But instead of folding, Miami killed the penalty. Seemingly galvanized by the Hutton incident and gaining momentum from the PK, the RedHawks took advantage of their first power play and tied it. Then another confrontation: Six-three sophomore Willie Knierim ended up in a scrap with Morgan Barron, with both getting the boot in the closing minutes of the second period. Miami netted the go-ahead goal with 54 seconds left in that frame. The third period was excruciating, as the RedHawks went into late survival mode – a documented area of weakness for this team in recent years – and they turned the last 20 minutes into a giant penalty kill. It was a gutsy win, an improbable win, and with team’s place in the Division I world still a bit of a question mark, Miami helped its resume royally by putting this one into the ‘W’ column. – The chemistry evolution of Josh Melnick and Gordie Green has a delight to watch. These guys could probably complete passes to each other in the dark. – Couldn’t believe Cornell, which played so well defensively, let Green skate in and score the go-ahead goal. He corralled a pass from Casey Gilling at the top of the faceoff circle and was unchallenged. So he penetrated and no one went to him. So he drove further and wired one home, lifting it over a sprawling defender. – That was the second and third major penalties for Miami in its past four games, and its third and fourth 10-minute misconduct, three of which have been for the game. In that span the RedHawks have 91 penalty minutes. – Melnick’s four-game point streak is the third-longest by anyone on the team. 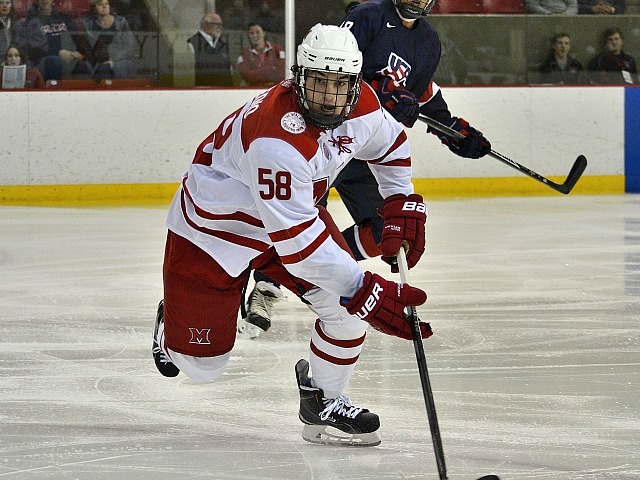 Melnick also had a five-game run earlier this season, and Green went five straight with at least one point as well. – CU starting goalie Matthew Galadja was pulled after 40 minutes. He allowed two goals on 10 shots through two periods, and while the Gilling shot appeared stoppable, Green’s goal was point blank and ticketed for the corner. Backup Hayden Stewart only faced three shots in the final stanza but stopped them all. FORWARDS: C-. Definitely a case in which the results were much better than the process. Gilling and Green scored power play goals, but this corps was practically non-existent the rest of the game. Miami was down to 10 forwards for the final 24 minutes with Knierim booted and Austin Alger – in his first game back from injury – very limited in ice time. Kiefer Sherwood committed several turnovers in the first period, including one that ultimately led to the Cornell goal. DEFENSEMEN: B. The Big Red finished with 30 shots, but not a ton were Grade-A chances. Cornell seemingly possessed the puck 80 percent of the game, especially early in the first period and the entire third, yet this corps playing with five – down a huge minutes eater in Hutton – did not seem to wear down. Scott Dornbrock didn’t dress for this one either, so this was an exceptionally young group post-Grant, with a senior (Louie Belpedio), two sophomores and two freshmen. GOALTENDING: A-. Lots happened and that’s the only reason it takes this far down to reach the Ryan Larkin love-fest in this game. As mentioned, not a ton of exceptional chances but Larkin stopped all but one of the good ones, and the only Cornell shot that went in was on a wrister from the high slot through traffic. He stopped all 12 he faced in the third period and finished with 29 saves, which believe it or not ties a season high. LINEUP CHANGES: For the second time in six games, Dornbrock was out. He had not missed a game since October of his sophomore year prior to the past month. Switzer returned to the ice after serving his two-game suspension. Grant Frederic remained in the lineup after taking Switzer’s place last weekend. F Zach LaValle also sat for the third time in five games after missing just three contests in all of 2016-17. Alger came back from an upper-body injury that cost him five starts. 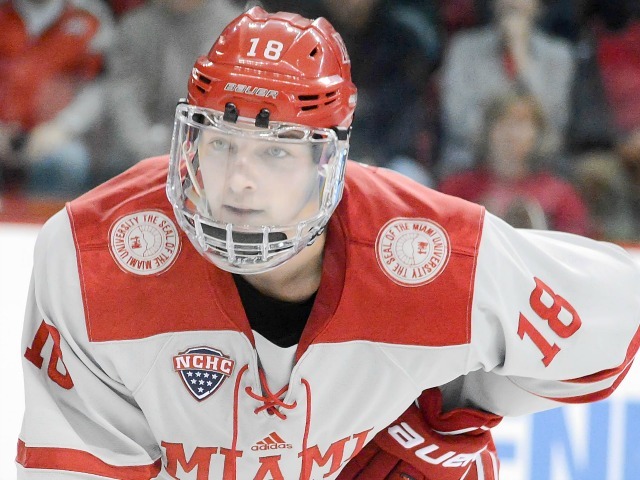 BOWLING GREEN, Ohio – Comfortably ahead by two goals in the second period, Miami saw its lead evaporate in less than 4:00 and under 10 minutes of real time on Friday. The RedHawks’ response? Score twice in the closing minutes of the decisive period, tack on an empty netter in the closing seconds and most importantly hold Bowling Green without a goal the remainder of the game. 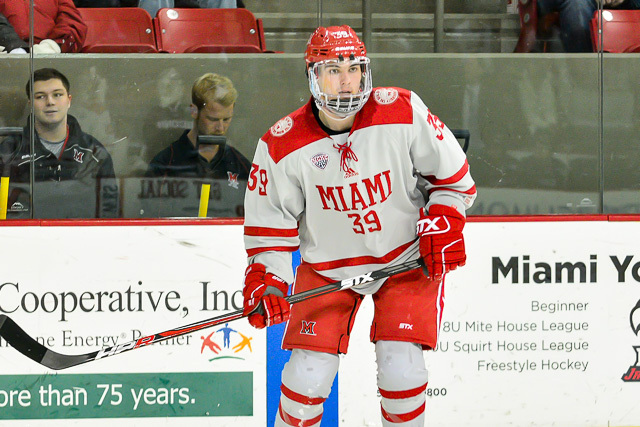 That combination spelled a 6-3 win for Miami at the Slater Family Ice Arena in Bowling Green. It was the sixth win of the season for the RedHawks, who won nine all of 2016-17. And the above is a major difference between that campaign and this one. It seems like Miami was in a ton of games that got away last season. The RedHawks haven’t been exempt from the occasional collapse this fall, but they’ve still found ways to earn several wins when they’ve suffered through major in-game hiccups. And on Friday they did that on the road and without faceoff leader Casey Gilling. Things won’t always go Miami’s way the remainder of the season. Injuries, bad calls, unlucky bounces are all parts of the game. But at least Miami is proving way better at handling them than last season. – Forgot to mention in the preview that Chaz Switzer was suspended two games total for his fighting major last Saturday. One game is mandated by the NCAA and the other by the league. What a joke. – Meyer likes the off-balance shots. – It was Carter Johnson’s first game of the season, as he was the fourth line left wing with Casey Gilling out, and Johnson played like every shift would be his last. It can’t be an easy season for Johnson, a scratch the first 12 games after logging 37 in 2016-17, but he proved Friday he can be counted on for quality minutes if/when his number is called again. – Carson Meyer really likes taking off-balance shots, perhaps more than any Miamian in recent history. He scored while nearly falling down last weekend and accurately wired a pair of shots in the same manor on Friday from the slot. – Bowling Green goals two and three both came on defensive breakdowns, which was a team MO last season and an area of improvement this year. Miami left the slot wide open for the second Falcons goal, and a BGSU forward burst through three RedHawks for a breakaway to tie it (and Miami was lucky it wasn’t assessed an additional penalty on the play). Gotta tighten up the D.
FORWARDS: B+. Crisp passing, solid puck control, four total goals by this corps. It was a good night overall despite missing Gilling. Three goals in three games for Meyer is a major pick-me-up, and Kiefer Sherwood was more involved in the game as well. DEFENSEMEN: B. A couple of lapses but overall a solid game. Grant Hutton scored twice and Louie Belpedio assisted on two goals. Transition passing was above average as well. GOALTENDING: B-. Ryan Larkin stopped just 11 of 14 shots, but he made a solid save right before the first goal, scored at the end of an extended shift. He had no chance on the second goal, and third was on a breakaway. Larkin did make a couple of outstanding saves. It’s a common theme for the young netminder: He doesn’t face a ton of shots, but a lot of the ones he sees are Grade-A. LINEUP CHANGES: As expected, Grant Frederic was back in the lineup with Switzer suspended. He was the seventh defenseman last Saturday and is playing a lot better than he did early in the season. With Gilling out, it was Johnson in. OXFORD, Ohio – In team sports, sometimes an emotional spark is needed. Miami, which was 0-9-2 vs. Minnesota-Duluth the past two-plus seasons, was losing again on Saturday when its galvanizing moment occurred. The RedHawks scored the next three goals and eradicated their winless streak vs. the Bulldogs, holding on for a 3-2 win at Cady Arena. A quick stage set: UMD is an excellent team that has a reputation for playing chippy hockey, playing on the edge, sometimes over the edge. Remember that one of the first times these teams met in Oxford, Chris Joyaux squared off after the final whistle with three dozen skaters and a handful of goalies on the ice. 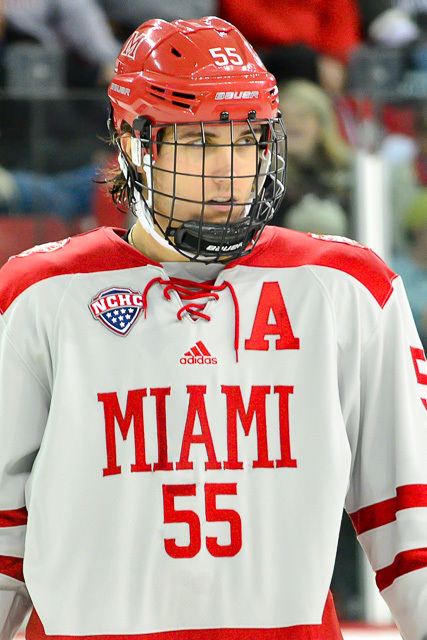 Miami defenseman Chaz Switzer (photo by Cathy Lachmann/BoB). So on Saturday, Minnesota-Duluth took a late poke at Miami goalie Ryan Larkin after a puck was clearly frozen. Chaz Switzer took exception and pushed another player behind the net, and the Bulldogs were not called. Minutes later, UMD took a run at Larkin, and again it was Switzer coming to his goalie’s defense, using offender Avery Peterson as a human punching bag before officials intervened. Switzer was given five minutes for fighting and a game disqualification penalty, which carries a one-game suspension. He left the ice to a standing ovation by fans that had little to cheer about to that point of the weekend. And here’s where hockey and the attitudes of many its fans/players/coaches/etc., deviates from the majority of other team sports. The hate mail may roll in from those in other sports’ camps and the college-hockey-is-pure-and-fighting-is-barbaric-crowd, and that’s OK. So here goes. Not only is Switzer a stud for what he did, it’s the officials’ fault he’s going to be suspended. 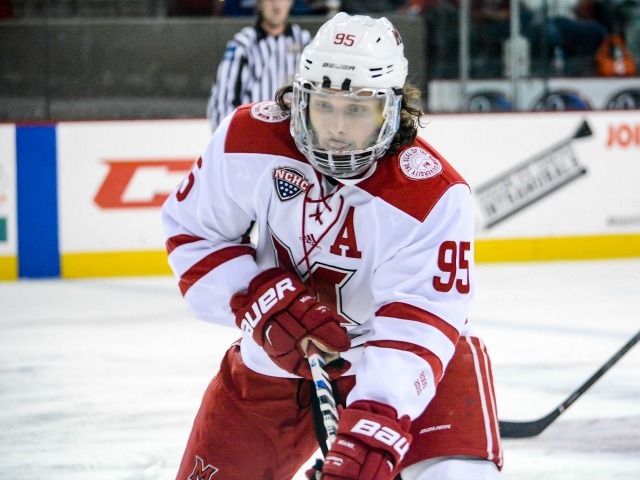 Larkin is a RedHawks star. Anyone who knows anything about UMD hockey knows its players are old-school WCHA all the way. That means ultra-physical play, after-the-whistle confrontations and yes, the occasional fisticuffs. If a dumb fan sitting at a word processor knows this, certainly NCHC officials do, right? So when Larkin gets hit the first time, you assess a penalty. If you don’t really think it warrants a Miami power play, you penalize the violator and Switzer two minutes each. That sends the message that we’re watching and goalie running will be punished. You do that, the second incident and resulting fighting major/suspension almost certainly doesn’t happen. Even if you blow that, there have been plenty of times when players in Switzer’s situation have just received a game misconduct than the DQ, which carries an automatic suspension. The officials didn’t have Larkin’s back, so Switzer did. Good for Switzer. If it wasn’t for players like Switzer, the NCAA would have 60 teams like Michigan who take out players’ knees and cross-check players in the head with relatively few repercussions. Miami dressed seven defensemen for this game, so the team went in able to absorb the loss of a blueliner. Switzer is a five or six defenseman who struggled at times last season and has stepped up his play significantly this fall. He had 294 penalty minutes in 121 games of juniors, so clearly he’s no stranger to extracurriculars. Don’t want to put words in anyone’s mouth, but it’s very, very likely Switzer earned ample respect from his teammates. He certainly made a lot of fans in his home rink. The on-ice results were obvious in the final two periods. Coach Enrico Blasi wasn’t asked about the incident (seriously, the event that changed the game never made it into the presser forum? ), and while he wisely did not address the incident he acknowledged the team struggled in the first period but played much better the final 40 minutes. Through the years, RedHawks teams rarely cross the line (think that was the first fighting major since Alden Hirschfeld seven years ago? ), but they typically are prepared to defend themselves when their opponents do. 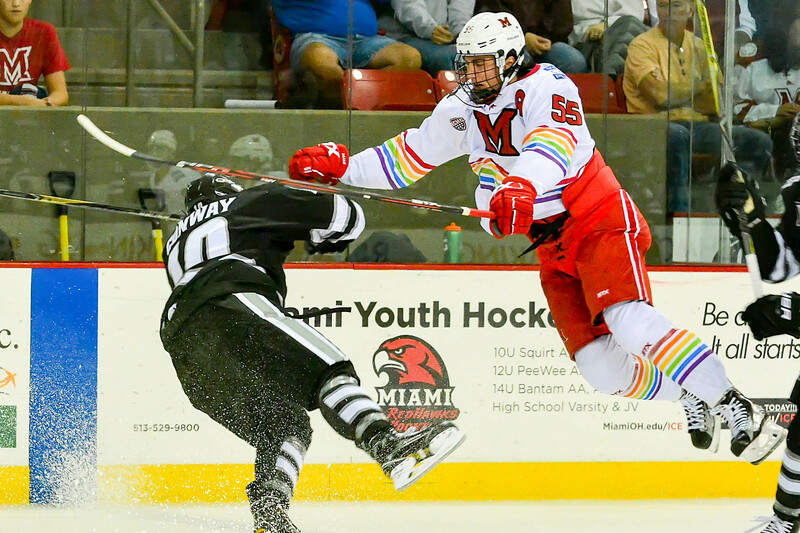 UMD took a couple of late shots at Miami’s goalie in an attempt to intimidate its southern Ohio rival, and it backfired. – Now onto far less controversial topics. Despite the split, Miami was the better team this weekend and certainly didn’t seem overmatched by a ranked Bulldogs team. Friday’s loss aside, it was a good weekend for Miami, which didn’t win its fifth game in 2016-17 until New Year’s Eve. – Carson Meyer broke out with goals in both ends of the series after scoring just one the first 10 games. Meyer heating up means good things for the Miami offense. – Same goes for Ryan Siroky, who scored on his only shot of the night for his second marker in three games. He had two more big hits on the weekend and has become a very solid third liner that no one wants to play against. – Karch Bachman picked up another assist and has already matched his point total of 2016-17 with an identical 2-4-6 line. He was the only forward to finish plus-2 in this game. – Despite those forwards stepping up, MU is averaging 1.8 goals over its last five games. Up next is Bowling Green, which is 11th in the NCAA in goals allowed per game. – UMD had 10 skaters take faceoffs. That might be an NCAA record. Only two had winning records, so perhaps the Bulldogs are auditioning their forwards? But still, 10 skaters? FORWARDS: B. With 11 forwards, there were a lot of different line combinations. Despite the odd number, the overall chemistry of this corps was good. Josh Melnick and Gordie Green put on a show with their goal, passing back and forth before Melnick buried a wrister for the eventual game winner. This group was solid defensively all weekend as well. DEFENSEMEN: B. Believe it or not, 29 shots allowed is the fourth-highest opponent total of the season for Miami. As mentioned above, the forwards chipped in on D, and the D was strong on D, thus the ‘B’. Many of those 29 shots were right at Larkin, who swallowed them up for easy saves. Grant Frederic played just two of the first eight games but has dressed for three of the last four and has been pretty much mistake-free. GOALTENDING: B. UMD’s first goal was a rapid-fire missile that Larkin had no chance on. Maybe Larkin could’ve gloved the Bulldogs’ second shot, but he stopped 27 shots and as usual allowed few second chances. LINEUP CHANGES: With Frederic in as the seventh defenseman, F Christian Mohs was scratched. Zach LaValle sat for the second consecutive game, and Willie Knierim played in his third straight. Frederic should play at least the front end of the BGSU series with Switzer suspended. It’s always tough to watch a team you root for get blown out. In certain sports with significant parity, it does happen to even the best teams. 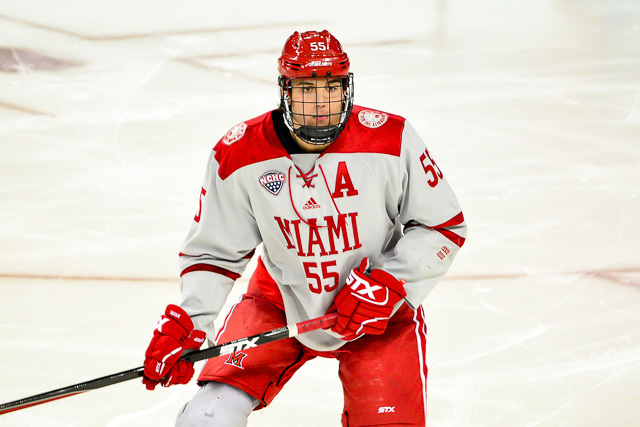 So in the ultra-competitive world of NCAA Division I hockey, there’s no reason to panic after Miami fell behind five goals in the first period in a 6-3 loss to Maine on Saturday. Not at all dismissing this pounding, but it’s still very early in the season and the RedHawks did earn a split on the road, which is rarely a bad thing. There were a number of positive things to take from this game for the Miami fan. – Miami did fight back after falling behind by five early. Sometimes in hockey we see blowouts snowball, and at least the RedHawks battled down the stretch, cutting the final deficit to three. – The power play is unreal. With Grant Hutton taking an active role on the man-advantage and Gordie Green joining the first unit full-time, Miami was 7-for-10 (70 percent) this weekend. And 3 of 5 in the finale, showing that even after the RedHawks lit the lamp four times on the man-advantage on Friday, Maine was unable to adjust. – And I know it’s not always popular to say, but the chippy-ness we saw in this game can generate momentum and galvanize a team. There were two skirmishes on Saturday, and in the first Green was targeted along the boards after a stoppage. He not only stood up for himself, Rourke Russell came to his defense and was engaged with opponents the entire time, and Carson Meyer got involved as well. The my-teammate-has-my-back mentality is a bigger factor in hockey than almost any other sport, and such an incident can only help a young team. – The other altercation: Captain Louie Belpedio ended up in a scrum midway through the third period and was tossed from the game. Sometimes captains have to get involved in these things. Again, this shows the team youngsters that the captain has everyone’s back. – And good for the officials, Jack Millea and Kevin Keenan, about whom I know nothing other than they handled the after-the-whistle antics very well. No reason to suspend anyone, instead choosing the 10-minute misconduct option to address the possibility of repeat offenders. – So Ryan Larkin. Again, blowouts happen. At one point, Patrick Roy let nine in for the Canadiens. Admittedly, he’s not exactly dominating, but let’s remember that this was a player who was named team MVP as a freshman at the team’s awards banquet. That’s a rarity. He had a .910 save percentage in 2016-17 despite getting pelted with Grade-A chances. The smart money is on him rebounding, and soon. – Follow up to that point: Larkin did have a .792 winning percentage for the weekend, and it’s interesting that Grant Valentine backed him up on Saturday. Valentine logged nine-plus minutes and stopped 2 of 3 shots, giving up a low between-the-pads goal. Chase Munroe played the entire exhibition game in Plymouth, Mich., last weekend, and he allowed five goals. He was the backup down the stretch in 2016-17, so it looks like coach Enrico Blasi prefers Valentine as a backup at this point. But as long as he is healthy, it’s obvious the net currently belongs to Larkin, and if that’s the case through 2019-20, Miami will likely thrive. 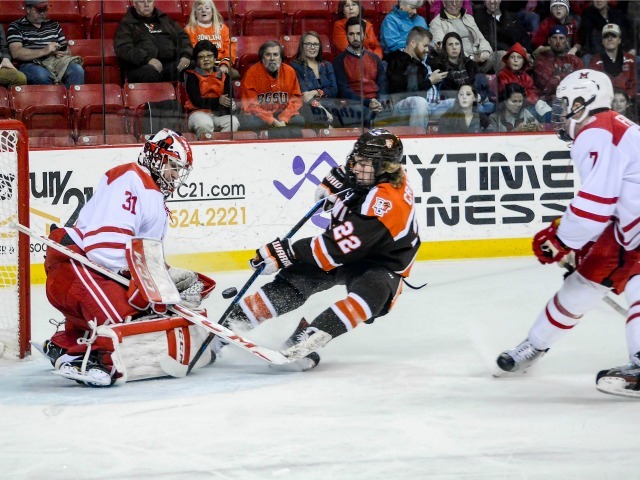 – The RedHawks pulled the goalie down by four late, which typically indicates a coach thinks his team has played well enough that it deserves a chance to play on what’s essentially a power play. Hutton scored on the 6-on-5 to make it a three-goal game. Really, if you’re going to lose, who cares if it’s 3-2 or 13-2? Coach Blasi doesn’t, and I’m in agreement. – It wasn’t a great night for Chaz Switzer. He was beaten, 1-on-1, resulting in Maine’s first goal, and his penalty on that play ultimately resulted in a 5-on-3 for another Black Bears goal. He was also on the ice for Maine’s third goal. – Some perspective about Hutton’s scoring rate: He has 14 goals in 40 games since the start of 2016-17, and 10th place on BoB’s unofficial all-time career defenseman goal leaderboard is Josh Harrold with 15. With five goals in five games already this season, Miami could be looking at one of its top-scoring blueliners of all-time. – Veli-Antti Tiuraniemi, a Black Bears defenseman, was committed to Miami last season and appeared to be headed to Oxford this fall. Instead he had a goal and an assist vs. the RedHawks. – Thanks to the University of Maine for its free high-quality online stream. The game experience in Orono is supposed to be fantastic, and BoB wishes the Black Bears nothing but success in the future, especially since subsequent wins by Maine will affect the PairWise! LINEUP CHANGES: F Zach LaValle was scratched after dressing for the first three games. Alex Alger played for the first time this season in his place. F Ryan Siroky replaced Ben Lown for both games this weekend. On defense, Alec Mahalak sat for the first time in 2017-18, as Grant Frederic logged his second game of the season. Fs Willie Knierim and Carter Johnson, plus D Bryce Hatten are the only Miami players not to log ice time this season, although Knierim played in Plymouth. OXFORD, Ohio – Friday’s script could have had a different ending for Miami. The RedHawks had two goals waved off, which was the final margin of defeat for in a 3-1 loss vs. No. 11 Providence at Cady Arena in the teams’ season opener. Miami’s Grant Hutton lays out a big hit in the first period (photo by Cathy Lachmann/BoB). After the teams traded goals in the first period, Miami appeared to have taken a second-period lead when Gordie Green roofed one on a breakaway. But the replay showed that the puck never entered the net, hitting the crossbar and kicking straight out. Right after the Friars’ third goal, the RedHawks’ Kiefer Sherwood went in alone and appeared to have tucked the puck under goalie Hayden Hawkey. Initially called a goal, the tally was taken off the board after it was ruled Sherwood interfered with Hawkey while driving the net. That last one was tough to digest, as Sherwood skated in diagonally and Hawkey moved up to the top of the crease to challenge the shooter when the alleged contact occurred. Providence also took a penalty on the play, so had the RedHawks scored, it would have cut their deficit to one and they would have had tons of momentum heading into the ensuing power play. Not in any way saying Miami got screwed. The Friars looked every bit an 11th-ranked team. – Miami started seven freshmen – Phil Knies, Casey Gilling, Austin Alger, Ben Lown, (redshirt) Christian Mohs at forward and Alec Mahalak and Rourke Russell on defense. Knies (pronounced ‘nighs’) impressed with his stickhandling, Alger, well, he scored the RedHawks’ only goal, and Mohs looked more confident than most coming off a season-ending knee injury. Russell looks like a natural agitator who is on course to become a fan favorite. Mahalak is raw but worked hard on Friday and appears to have a lot of upside. – Miami was down two with three minutes remaining and possessed the puck in the offensive zone for a minute but waited until under 2:00 before pulling Ryan Larkin. In today’s game the goalie needs to come out earlier in a two-goal game. – The RedHawks donned ‘You Can Play’ jerseys in honor of Brendan Burke, who passed away 6½ years ago. Classy move by Miami to remember the former student manager. – Speaking of passing away, usher Howard Jackson passed away this off-season after an extensive battle with cancer. He was a mainstay at the top of sections 11/12 since the rink opened. FORWARDS: C-. Only one goal but this corps generated some excellent chances against a top-echelon team. There was a lot of good passing and a lot of bad, which is not unexpected in early October. Coach Enrico Blasi wasn’t afraid to use three freshman forwards on his second power play unit. DEFENSEMEN: C+. It seems like Providence had fewer A-plus chances than most Miami opponents did last season. The new guys, while on the smallish side, both seem like they can move the puck pretty well and aren’t afraid to play physically. GOALTENDING: C+. Larkin stopped 27 of 30 shots for a .900 save percentage. The first goal was on a quick release from pretty close and the last one was definitely stoppable. As usual Larkin made a couple of outstanding saves to keep Miami in it.